The Studio, South Street, Lancing. William Norman McCarthy (Norman) was born at Walthamstow (Chingford) in Essex on April 3, 1887 and his younger brother, Eric Justin McCarthy (Eric) at Walthamstow on July 7, 1890. Their father was William Henry Lloyd McCarthy, who had been born in 1858 at Kensington, and was the son of a London pawnbroker, John Justin McCarthy, who had been born in about 1827, and his wife Mary Ann Lloyd. Their mother was Mary Harriot McCarthy, née Austen, born in 1857 at Shoreditch. After leaving school William Henry McCarthy probably worked briefly for his father. The 1881 census records, however, that he and a younger brother, Charles Alexander McCarthy, had begun operating their own pawnbroker's shop at 171 Great Cambridge Street in Shoreditch. William married Mary on 12 June 1886 at Dalston. When registering his son Norman's birth in the following year, he tactfully declared that he was a jeweller. Eric's birth certificate, however, is more forthright and confirms that his father was indeed a pawnbroker. It also discloses that William Henry and his family were living at this date at Lombard House in Wood Street in Walthamstow. Despite having made a successful career as a pawnbroker, William Henry McCarthy had longings to become an artist. According to the Desmond Cory website (www.desmondcory.com/mccarthy/text4.htm), William Henry McCarthy drew many of the illustrations for Austen's Hand-book to Canterbury, which was published in 1897. By the time the 1901 census was held, he had moved with his family to a house in Greenfield Road at Sutton in Surrey, and was working as an "artist sculptor". In making his career change, William Henry showed considerable courage, given that he had a large family to support: Norman McCarthy, Leslie McCarthy (born in 1889, but died aged 4), Eric McCarthy, Ivan Austen McCarthy (born in 1893 at Walthamstow), Eileen (born in 1896 at Higham Park; died 1968), and Gladys Ethel McCarthy (born in 1899 at Chingford). Ivan died of diphtheria and associated heart failure in 1904, aged only 11. At this date the McCarthys were living at 24 Dagnall Park in Selhurst. The death certificate records that William Henry McCarthy was a "barrow builder", whatever this may mean. Later, William Henry and his family moved south to Lancing. The 1911 census records his address as The Studio, which was in South Street at Lancing, next to the Three Horseshoes Inn. It was here that Eric and Norman created a successful business for themselves as photographers. Suggestions that William Henry worked for a time as an art teacher at Lancing College remain to be confirmed. Eric and Norman McCarthy established their photographic business at Lancing by 1909. Eric was still in his teens, and it seems safe to assume that at first Norman, as the elder brother, took the lead role in the business. Pip Barker reproduces a photograph of the studio and house taken in 1910 in his book Lancing and Sompting from early photographs (1979, Nostalgia Publications, Shoreham). Philip Fry, another local historian, devotes several pages to the McCarthys in his book Lancing and Sompting - a second selection (1998, Sutton, Stroud), and includes a splendid picture of the family relaxing on South Lancing beach in 1912. According to Fry, Eric was a keen violinist and banjo player, often performing at dances and other local events. He married Constance (Connie) Elizabeth Austen, daughter of Percy Lush Austen, a deceased bank clerk, on October 3, 1917, at the Parish Church in West Hampstead. At the time he was a "2nd air mechanic" in the Royal Flying Corps. He described his father on the marriage certificate as an "artist". However, there is a possibility that William McCarthy had earlier followed his sons into photography, as Kelly's 1915 Sussex Directory lists a photographer of this name at Marine Parade in Worthing. If correctly listed, he must soon have changed his mind, and returned to his art. Neither he nor his sons are listed in Kelly's 1918 Directory. David Schenck has discovered that between 1921 and 1923 William Henry McCarthy lived in a house called Southwood in Oakwood Road, Horley. It is believed he then moved to Storrington. On August 15, 1921 he purchased a blacksmith's shop and a cottage in Mill Road, North Lancing, and commissioned the distinguished Horley architect, Blunden Shadbolt (1879-1949) to design a replacement for the cottage using old materials. The result was "Ye Old Tithe Barn", which William ran as a guesthouse between 1924 and 1931, before handing over to his son, Norman. William then retired to a house called Seafield in Brighton Road, Lancing. The so-called Tithe Barn was demolished in 1963. In 1924 Eric and Norman dissolved their partnership because Norman wanted to give up photography. Eric, however, continued to work as a photographer, moving his studio to Ivy Cottages in East Street by 1930. He died suddenly from dental sepsis in 1931, aged only 41. In the 1920s Norman lived with his parents, but Eric and Connie lived elsewhere, probably at East Street. In 1932 Norman married Violet Grieves and they set up their own guesthouse (the Fircroft Private Hotel) in Upper Brighton Road, Lancing. It had riding stables attached. After Norman died in 1946, Violet continued to run the guesthouse. Gladys, Eric and Justin's younger sister, married Gerard ("Phil") Gosselin in 1925 and moved away from Lancing. Mary McCarthy died in 1925, and at the age of 70 William Henry married for a second time. His new bride, Iris Mary Chatfield, who had been born at Thakeham, was only 25! On 16 February 1928 she bore him a son: John Lloyd McCarthy ("Shaun"). William Henry died at Hartland in Devon on 7 February, 1937; Iris fifty years later in Glamorgan in 1987. Shaun, who became a university teacher and a very successful novelist, writing under the name of Desmond Cory, died at Marbella in Spain in January 2001. The McCarthy brothers were the publishers of an extensive series of mostly anonymous but instantly recognisable real photographic cards of Lancing, Southwick, Shoreham, Hove, Preston, Rustington, Littlehampton, Arundel, Amberley and Steyning (also Cissbury and Chanctonbury Ring), which have unusually large handwritten captions and often serial numbers preceded by N0 or N0. Only capitals are used for the captions and the initial capital of each word tends to be larger than the rest. At least two people seem to have written the captions, one using generally plain capitals and the other favouring capitals with serifs. Often the "L" of "Lancing" is crossed through diagonally (like a German 7), and the letter "H" is sometimes embellished with diagonal extensions pointing to the left. Sometimes letters are reversed, which indicates that the captions were written directly on the negatives mirror fashion, but not without mistakes. The photographs on most cards are black and white, but a few are sepia tinted. The photographs usually have white borders. The McCarthy brothers may have begun publishing postcards before opening their studio in Lancing. Many of the 60 or more real photographic cards of Hove that they are thought to have issued have been found with 1908 postmarks, which suggests that they could be precursors of the Lancing and Shoreham cards, which have postmarks starting in 1909. Examples include "Medina Esplanade, Hove, N0 3"; "Kings Gardens, Hove, N0 6"; "Sussex Hotel. Hove" (May 1908), "Queens Gardens and Princes Hotel, Hove N0 17"; "Walsingham Terrace from Front, Hove, N0 26"; "Church Road, from Hove Street, Hove, N0 28"; "Albany Villas, Hove, N0 33" and "St Aubyn's from Church Road, Hove, N0 53"). A few Hove cards lack serial numbers, e.g. "Coast Guard Cottages, Kings Road, Hove" (March 1908 postmark seen) and "St Aubyn's, Hove" (with an April 1908 postmark). The existence of the Hove cards raises the possibility that the McCarthy brothers settled briefly in Hove before moving to Lancing. Lancing and Shoreham cards that have been found with 1909 postmarks include "The Terrace, Lancing N0 148" and "Norfolk Bridge, Shoreham, N0 2. N0 215" (note the peculiar double number), but 1910 and later postmarks are more usual. In the Brighton & District Trades Directory of 1912-1913 the McCarthy brothers described themselves as "photo postcard specialists". By this date they were publishing real photographic cards with a tiny logo in the right lower corner consisting of an "M" superimposed on a "C". These cards resemble their anonymous predecessors in many ways, having large captions and serial numbers preceded by N0, but they generally lack borders and the writing tends to be even more flamboyant and "fussy" with many more diagonal extensions and also decorative curls. As before, the "L" of "Lancing" is crossed through, and double numbers continue to occur (e.g. "North Lancing N0 1. N0 166"). Again two types of handwriting are evident, one with serifs and one without. The McCarthy brothers are perhaps best known for their cards of the spectacular storm damage to the beach houses at Shoreham's Bungalow Town in March 1913. They themselves are said to be present as spectators in some of the photographs. 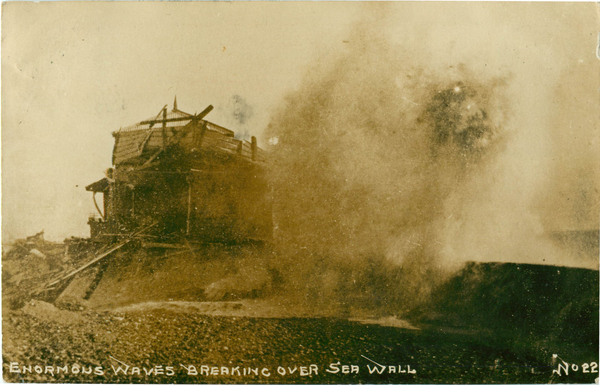 They also issued several cards showing the remains of Worthing Pier after its landward end was washed away by the storm. All these cards have captions with diagonally extended letters, and many also have the MC logo, but some cards of storm waves attacking the bungalows lack the logo and are independently numbered. The McCarthy cards of Lancing are a pictorial treasure trove, providing nostalgic glimpses of old flint buildings, back lanes, and traditional agricultural activities such as shepherding and cutting hay. They are a valuable record of how the area once looked, before more recent housing development and the mass invasion of the countryside by the motor car. Card N0 111 showing "Fine Elm Trees. North Road. Lancing" is a reminder of how these tall, statuesque trees were once a major feature of the landscape. A few cards dating from around 1912 are embossed "McCarthy Bros, Lancing" in the bottom right corner. The numbering on McCarthy cards extends to at least 914 ("High Street, Littlehampton"), but numbers above about 250 are relatively uncommon, which may indicate that they were issued much later than the rest. A view of Arundel Castle is N0 501, N0 702 shows Preston Church and a Rustington card is numbered 708. Many unnumbered cards also exist, recording family groups and social gatherings, mainly at Lancing. In total, the McCarthy brothers must have issued well over 1000 different cards. Some cards appear to have been added to the range after the First World War (e.g. N0 604, which shows a seaplane in Shoreham Harbour), but most were undoubtedly introduced before the war. Postmarks suggest that Eric was still reprinting cards at the time of his death. Harold Camburn of Tunbridge Wells reprinted Card 183 of the Lancing care home called The Chestnuts as Card 149 in his Wells Series. He successfully erased and replaced the original caption, but the original number proved more defiant and traces remained. It is not known whether Camburn reissued any other McCarthy cards. Acknowledgement: David Schenck has made a ten year study of the architect Blunden Shadbolt and has kindly allowed this website to draw on his researches relating to the commissioning of Ye Old Tithe Barn.